Motoroyale, Kinetic group’s venture of multi-brand superbikes, today announced three further global brand tie-ups, and the launch of seven new superbikes in what can be termed as a historic event. As the country’s first multi-brand super bike manufacturer, Motoroyale endeavors to be the one-stop shop for bike enthusiasts and will provide Supersports, Street Nakeds, Cruisers, Hipsters, Off Roaders, Tourers and many other motorcycle segments in India through world class showrooms in the 6 top cities in India in phase 1. SWM and FB Mondial are both Italian heritage brands, while Hyosung is based out of South Korea and was first launched in India by the Kinetic group and has a base of 7000 customers. The Hyosung’s are built for comfort, speed, quality and a value for money proposition. Motoroyale unveiled 7 new products from different categories and brands giving justification to its concept of being a one-stop shop for all bike enthusiasts. From the street naked category, the Brutale 800 RR offers the best power to weight ratio in the market, with 140 BHP making it a real monster. Norton makes the popular Commando and Dominator motorcycles, which are 961 cc, all British marquee classics. 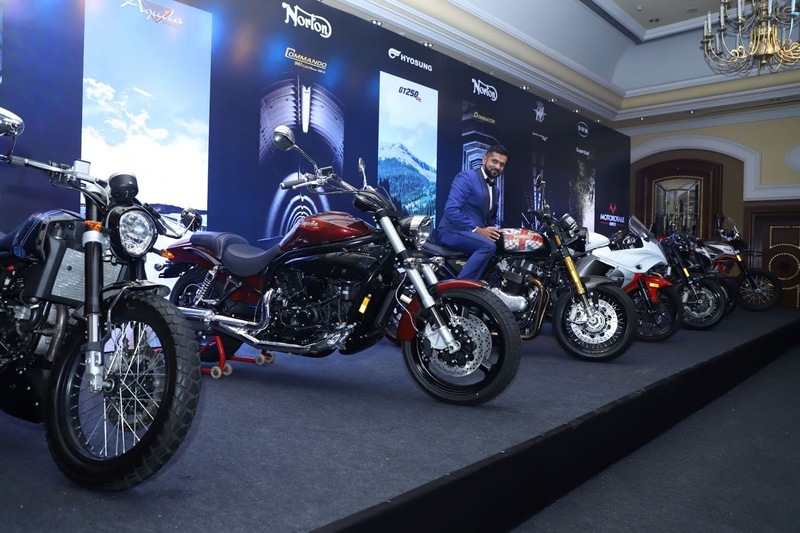 Motoroyale announced the 37 units limited edition Norton Commando and Dominator exclusively for India. Motoroyale launches SWM based in Italy with its first product, the SuperDual which is a true on road-off road motorcycle making it one of its kind. Motoroyale also announced an all new category of the Hipster, with the FB Mondial’s HPS 300, which is a modern retro motorcycle for people with taste. The Aquila 650 and the GT 250 R completes the range of Motoroyale by offering cruisers and sports bikes at a very attractive price point. The motorcycles will be assembled in India at Kinetic’s plant in a dedicated space for Motoroyale stretched over 52 acres in Ahmednagar, that holds a capacity of assembling 30,000 vehicles annually.Motoroyale has set up world class facilities for engine and vehicle assemblies for its various brands taking into consideration the product quality and service. Followed by Cochin and Bangalore showroom launches in November. Motoroyale is also looking for the correct dealership applicants and plans to open another 6 in the coming 12 months in cities like Pune, Indore, Chandigarh, Ahmedbad, Jaipur, Kolkata and other important markets. Wow wonderful news. All the bikes look stunning.